Ideas of shape-shifting are ancient. The possibility that a person can take the form of another being - usually an animal - can be traced back thousands of years, across diverse cultures, continents and religions. Shape-shifting appears in fairy tales and myths. In stories from Greek mythology, Zeus transformed into a swan, a bull, and an ant. The myths of the ancient Egyptians depicted gods with animal heads, such as Horus and the dog-headed Anubis, while those of the Norsemen showed the mischievous god Loki change into a giant and a woman, as well as various bestial forms. Some of the earliest depictions of shape-shifting come from the Cave of the Trois-Frères, in southern France, where many believe that the drawings indicate a shamanic belief in the ritual of transformation. In later Christianity shape-shifting became a metaphor for the merely human to metamorphose into the divine. In the Mass bread and wine are miraculously transformed into the body of Christ. 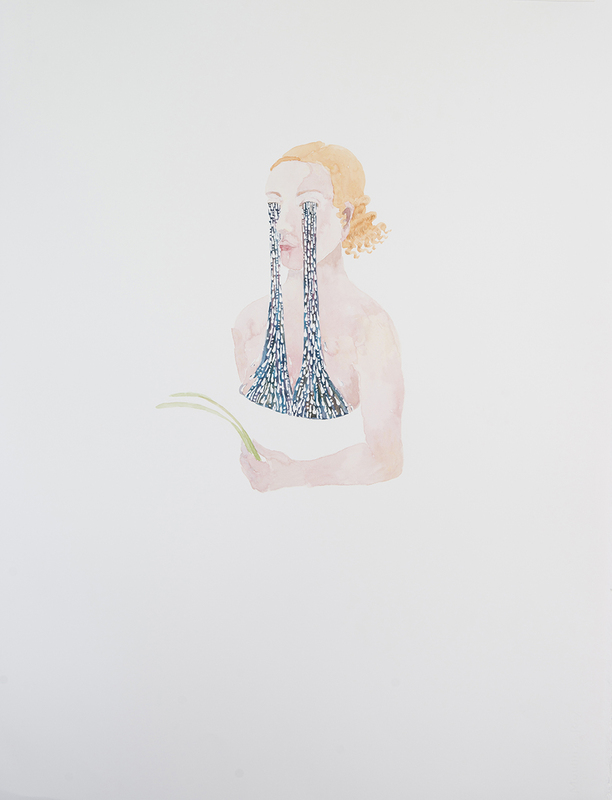 The Irish artist, Alice Maher, has always flirted with notions of transformation in its many guises. In a series of autobiographical photographs in which she used herself as a model, she covered her face with a mask of snail shells, wore a necklace of lambs' tongues, and covered her body and arms with birds' wings and moss. These powerful images spoke of the slippage between the feminine and the chthonic, between nature and nurture, the sensual, the profane and the divine. Working with a diverse range of materials she has, in the past, created installations, drawings, sculptures and photographs. ScreenHunter_2243 Sep. 26 09.42Now, in a series of meticulously rendered watercolours, The Glorious Maid of the Charnel House, she continues to investigate the theme of metamorphosis, a world where the female body shifts between what is recognisably human to embrace elements of flora and fauna, as well as subvert notions of what is internal and external, what can be revealed and what must remain secret. In the title work of her show - the inaugural exhibition in Purdy Hicks new South Kensington space - a delicately painted, rosy pre-pubescent girl stands barefoot and naked, her Medusa-like locks cascading in long tresses around her vulnerable body. Only this is not hair but a spill of visceral guts, fleshy and tumbling from her head, filled with what appear to be lumps of dark green faecal matter or, at least, something highly toxic. In countries where ground suitable for burial was scarce, corpses were interred following death to allow decomposition to occur. The remains, once stripped bare of flesh, would then be exhumed and moved to an ossuary or ‘charnel house', allowing the original burial place to be reused. After a recent brush with cancer Alice Maher's Charnel House works reveal not only a preoccupation with the corporeal transformations that occur with illness and death – from sentient body to a handful of bones – but also a fascination with our contemporary discomfort with the abject, with decay and deterioration. In these images the body sprouts alien protuberances, transforming what is familiar and healthy into something surreal and alien. Complex and painful emotions mutate to become visible and take on a physical form, so that what is normally hidden and taboo is revealed. Elsewhere a girl has been part turned into a hind (perhaps by a spell? ); while a naked woman with Japanese-like, witchy hair, crouches beneath the weight of a heart, strapped to her back like a giant ruck-sack. But this heart is not some romantic symbol but a fleshy object that's been ripped from the body, as indicated by the severed arteries. The theme of Sisyphusian effort is further explored in the disquieting, Burden, where another woman carries a half-human, half-ossified load strapped to her back like an inverted doppelganger. Another figure sits with her back to the viewer, her naked torso covered with red eyes. Part wounds – or perhaps the resulting of some sort of homeopathic process such as ‘cupping' - and part talisman (to protect against the evil eye), some have slipped from her back to gather on the ground like rose petals or dried pox scabs. ScreenHunter_2244 Sep. 26 09.43Other figures erupt in rivers of tears, in leafy fountains that pour from their guts. One, ceaselessly, bangs her head against a tower of bricks, while in the large charcoal and chalk work, Matrix, a woman sports an extravagant serpentine headdress fashioned from intestines into a Gordian knot. It's as if there's no room in her body for this burgeoning growth, which has been forced to extrude unnaturally through her head. In another scene a girl lies beneath a monstrous fury dog. Its presence is threatening and nightmarish, recalling the incubus in the 1781 oil painting The Nightmare by Anglo-Swiss artist Henry Fuseli. 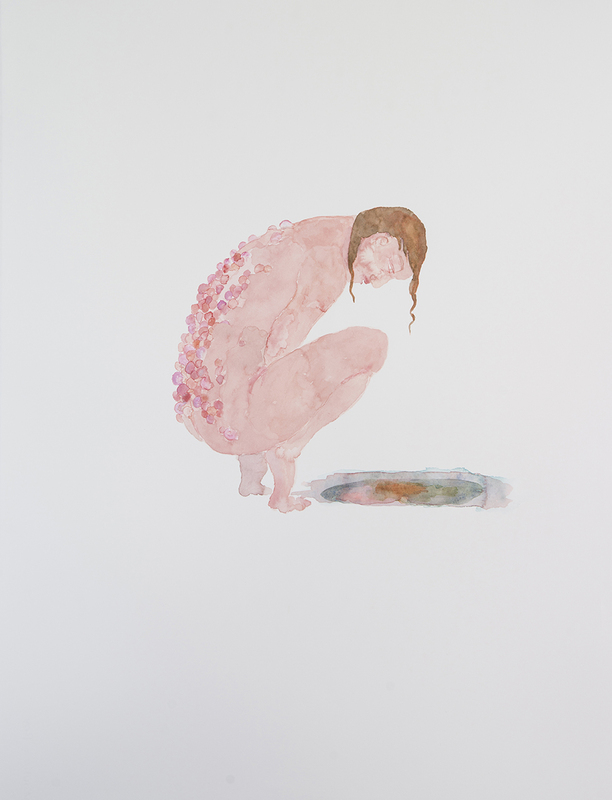 Before making this series of work Alice Maher spent time looking at classical medical texts, the sort that show stylised drawings of women holding open their stomachs to reveal the structure of the uterus beneath the skin. This 19th century flavour permeates The Sick Rose, (the title, of course, is from Blake) where coral-like branches protrude from the ears of the female head in an imitation of fashionable Victorian curls. The Maids of the title also cannot but fail to trigger thoughts of Genet's 1947 famously transgressive play, where metamorphosis and transformation resonate throughout. In a luxurious bedroom, two French maids fantasise about killing their mistress, playing out dangerous and sadistic scenarios as they plan her violent death and try out different roles. Not for the faint-hearted, the play, as with Alice Maher's paintings, is full of blood symbolism and explores the corruption of both body and psyche though the transformative power of the imagination. Whilst there is no suggestion of murderous thoughts in Maher's work, there is, nevertheless, a sense of the grotesque, of a spectacle where borders are transgressed. 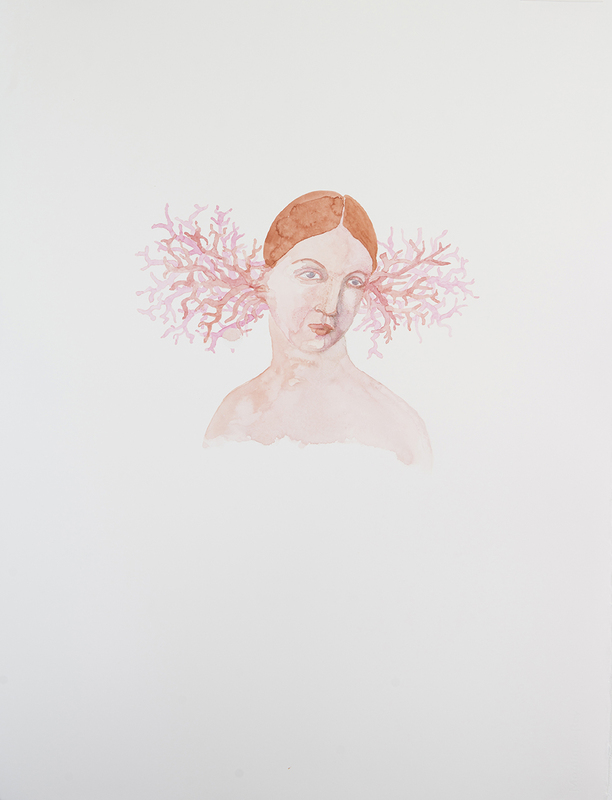 The subtly of Alice Maher's work lies not only in its flawless execution but in her ability to weave narratives of personal trauma with references from fairy tale, psychoanalysis, anthropological myth and the history of botanical illustration. Her hybrid half-beings invoke the monstrous figures of Hieronymus Bosch, as well as the surreal transformations of Leanora Carrington and Max Ernst. Apparently quiet and rather beautiful these small watercolours celebrate not only the sacred and the profane but female anarchy, ambiguity, creativity and power.